The bonde travels up and down Santa Teresa in Rio de Janeiro. It is always packed, because it is the cheapest mode of transportation. There’s a saying in Rio that some people use when they’ve eaten far too much. 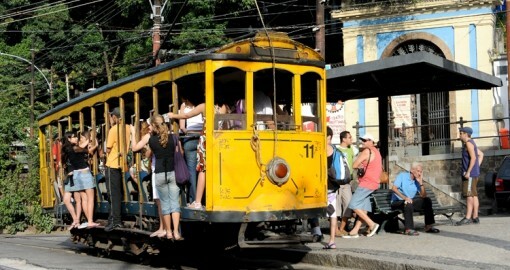 “Cheio como um bonde.” It means, “Full as a streetcar.” This particular saying has some merit. The Bondes are almost always packed. They are streetcars with benched seats and no walls or doors. Though the fare is cheap, between 10 and 30 centavos, there are generally people who hang off the sides until they’re asked to pay the fare and then jump off. The only time I needed a Bonde was to go up Santa Teresa, a mountain in the city center. It provided a great view, and it was great for meeting other tourists also seeing the city. I think I met folks from 5 different countries who were sitting or hanging around me. Unfortunately, while I was in Rio one of the Bondes came off it’s track and flipped over, so the Bonde is shut down right now in Santa Teresa while the city takes its sweet time to do safety checks and modifications. It was a terrible accident, and many people died or were injured, but the process of repair is more extensive than most Cariocas would like. Read about the accident and the updates here. If you’d still like to see the famous mountain and its sites along the way, there are other modes of transportation available to you. For example, you can take a moto-taxi or something called a combe. Moto taxis are one of the fastest ways to get up and down large mountains including Santa Teresa. 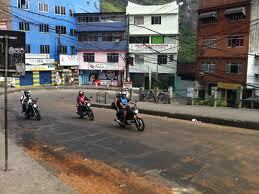 These motos are on their way up the street in a mountain favela called Rocinha. up and down the mountain. It’s 2 reals, and for the adventurous type, is a fun way to go. They are also a great mode of transportation in any favela. On the way down the mountain, however, you may want to let them know to, “Mantenha o motor funcionando, por favor.” This means, “Keep the motor running, please.” The drivers are known to turn them off to save on gas. The combe is also cheap at 2 reals per ride, and is a safer way to go, if you prefer to stay off of motorcycles. 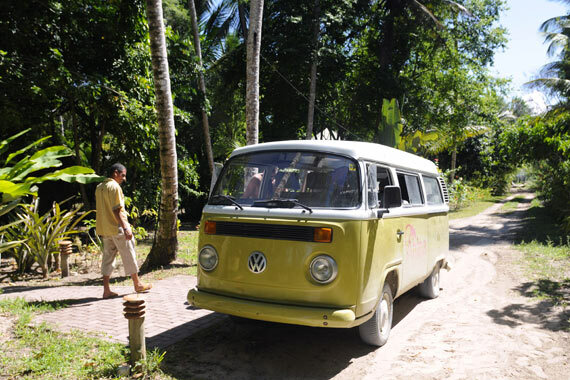 The combe is a Volks Wagon mini bus that also goes up and down the mountain. Also 2 reals, they pack in about 10 people and run every 10 to 20 minutes. They are a little more limited as to which routes they’ll take and where they wind up, but they’re safer. This entry was posted in Transportation and tagged Bonde, Brasil, Brazil, Combe, Moto taxi, Rio de Janeiro, Santa Teresa, Transportation. Bookmark the permalink.